This was everything I ever wanted out of a Star Wars novel. Timothy Zahn's Heir to the Empire Trilogy was my introduction to Star Wars novels. If this had to be the last one I ever read, I think I could be happy. Much like Rogue One, Timothy Zahn's Thrawn expertly painted in the gaps left by the original trilogy of movies, making an already great work of popular art even better. This is so because Zahn managed to answer more questions than he posed. For example, the complete lack of aliens within the Imperial Navy gets a plausible explanation that fits in with all of the movies. Also, the process by which the Imperial Navy and Army came to staffed and led by incompetent lackwits, despite having the resources of an entire galaxy to call on, is laid bare. With an intentionally open-ended story, this is a remarkable feat. Not least because the available narrative space for Zahn is, if anything, more limited than it was when he initially created Grand Admiral Thrawn. In 1991, references to the Clone Wars were just that. Zahn ended up making choices to move his story along [without any objections at the time] that were simply abrogated when George Lucas wrote the prequels. The gap thus created was a large part of what doomed the previous iteration of Thrawn's origin story, Outbound Flight. Trying to shoehorn in the continuity of the prequels made that book plod along without any sparkle. 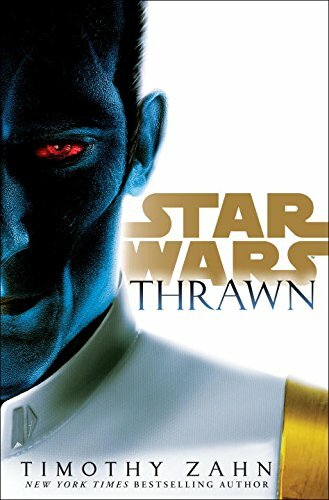 Thus, Disney's decision to sweep away all of the previous books, comics, and videogames seems to have given Zahn an opportunity to reimagine Thrawn without being bound by even his own works. In my opinion, this Thrawn instantiates who he was meant to be better than before. He is the best version of himself. Zahn commented on his Facebook page that this is the same Thrawn we saw before, just in a new light. Maybe so. But he sure feels a bit different to me. It has been twenty-five years since Zahn introduced us to the Grand Admiral, and Disney's decision plus the weight of twenty-five years of additional writing experience created an opportunity to make something new. The vehicle by which we are introduced to Thrawn's early Imperial career is a political thriller. [along with excepts from Thrawn's journal] I didn't expect that [I'm not sure what I expected] but I think it works. While we do get to see Thrawn's tactical and strategic virtuosity, the scope of his campaigns are limited by the scope of his responsibilities. What we do get to see are the political machinations that characterized the day-to-day business of the Empire. We get to see Imperial politics mostly through the eyes of Arihnda Pryce [a tie-in to the on-going Star Wars Rebels series] and Eli Vanto, an Imperial ensign who speaks a common language with Thrawn and ends up trailing Thrawn throughout his career. Pryce is exactly the kind of person who prospered in the years following the end of the Clone Wars: amoral, ruthless, and calculating. Here we find the root cause of the Empire's rot. Pryce, while bright and capable, came to be Governor of Lothal because of who she knew, and whom she had betrayed. A functioning bureaucracy requires a bit more probity than this. There are things in the universe that simply and purely evil. A warrior does not seek to understand them, or to compromise with them. He seeks only to obliterate them. The things that Thrawn finds abominable, and the things he finds excusable, are very different things from almost everyone around him. He clearly disliked the chaos of the late Republic, and liked the orderliness of the new Empire, despite its tyranny. I appreciated this, Thrawn really is an outsider, an alien, from a culture with a completely different point of view. Yet at the same time he felt very familiar. The analogue I find ready to hand are the classical Romans. The Thrawn we meet in the early Empire is good at the hard virtues. His courage and stoicism are undeniable. As is his lack of pity. He is honest to the point of bluntness. He lacks the soft virtues: kindness, gentleness, compassion. He never seeks wanton destruction, but suffering as such does not faze him. Disorder does. The portrait of Rome I have in mind is the one Chesterton painted in the first part of The Everlasting Man. Rome represented the best of the ancient world, but it was still very different from the Christian civilization that eventually replaced it. Just, but harsh. Uncompromising and stern. And very, very good at war. Most of us modern Westerners would also be taken aback at something a 1st century Roman commander would find obvious and proper, if we ever met one. Much like Scipio Africanus, Thrawn's political adversaries tend to find him a bit of a naïf at politics. It is left ambiguous whether Thrawn is really bad at politics. All the Imperials think he is, but Clausewitz said that war is a continuation of politics by other means. Insofar as Thrawn is quite adept at manipulating his opponents on the battlefield, the idea that he cannot do the same to politicians seems strange. It is just possible that Thrawn isn't interested, or doesn't care, because that is way his alien mind works. He could just have a blind spot there. It is also possible that is is playing a really long game. The story I'm thinking of is about John von Neumann, that he could have a normal conversation with absolutely anyone, from a 5-year old to one of his peers in physics and mathematics. The idea is that he was so smart that he was just simulating what normal looked like to whomever he was talking to. This is like that, but if you had the added goal of manipulating and controlling the person you were talking to. What that long game really is, we don't know. We know more than we started, however, which is good enough for me. I loved this book, and I suspect many Star Wars fans will too. You might even like it if you aren't a fan. I've read a lot of Star Wars books, and I haven't liked most of them. This one is good, a thought-provoking exercise in order and justice through the mind of an enemy commander.